Yesterday morning we woke up to only +3°C at the EISCAT Sodankylä site, and it's the end of June! What a surprise then, when our colleague Lassi Roininen shows a couple of videos he took while coming on the bus from Ivalo: it's been snowing some 100 km north of Sodankylä. 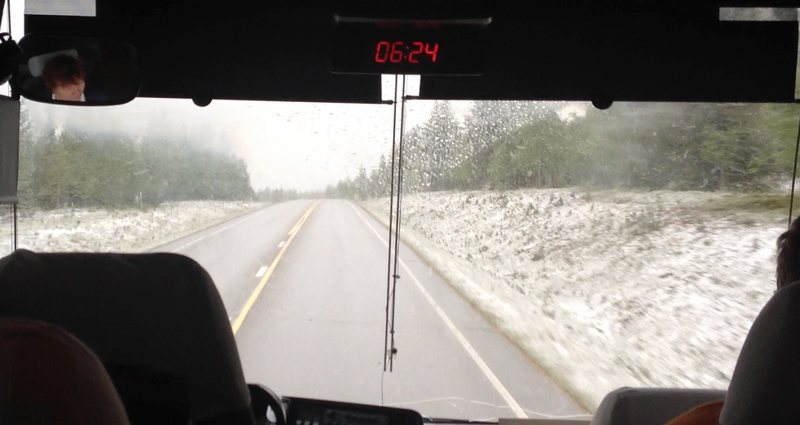 We always thought that "Summer in Lapland is short and wet, but you do get a little snow" was a joke. But the good thing about it is that it's lethal to mosquitos. More about mosquitos in our next Science Tuesday feature. Photo: Lassi Roininen; click to enlarge.